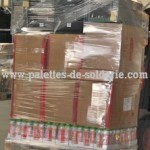 Import the best Outlet in destocking pallets containing an average of 45,000 items per container. A large variety of categories represented there as crafts, bazaar, decoration, toy, cosmetics, textiles, clothing, the food etc … hundreds of references. The container value of the store is about 60 000 to 75 000. Our selling price is only 5850 euros HT or – 10% of the retail price. Possibility to arrange delivery on France as internationally.